The Samsung Galaxy A7 has finally been released in Nepal at the price of NPR 45,090. The smartphone is surely Samsung's top smartphone in the Galaxy A series due to its high end specs and features. Notably, it is the first smartphone on which Samsung has employed a full metal uni-body design. Also, the Samsung Galaxy A7 is thinner than most smartphones falling in this price range with just the thickness of 6.3 mm. The Samsung Galaxy A7 comes with a 5.5 inch super AMOLED capacitive touchscreen with a resolution of 1080 x 1920 pixels (~401 ppi pixel density). The high pixel density on this phone brings out its best colors and provides a sharp and vivid display. Also, the display screen is protected by a Corning Gorilla Glass 4 and the viewing angles are great. Looking into its processing, it provides excellent speed with smooth navigation. The CPUs used on this device are a quad-core 1.5 GHz Cortex-A53 and a quad-core 1.0 GHz Cortex-A53 (A700FD). Also, the chipset installed in this phone is a Qualcomm MSM8939 Snapdragon 615 (A700FD) and an Adreno 405 (A700FD) is used as its GPU. The frame rates while playing games on this smartphones are pretty nice which allows games to be played the way they were meant to be. Like most smartphones of today, the Samsung Galaxy A7 comes with a set of two cameras. A 13 MP primary camera with LED flash and autofocus and an 5 MP secondary camera is equipped on the smartphone. The smartphone provides features like geo-tagging, touch-focus, panorama, face detection and HDR for clicking better photos and the rear camera can record videos in full HD i.e. 1080p@30fps. Furthermore, the front facing camera can also record videos at 1080p in both landscape and portrait mode. 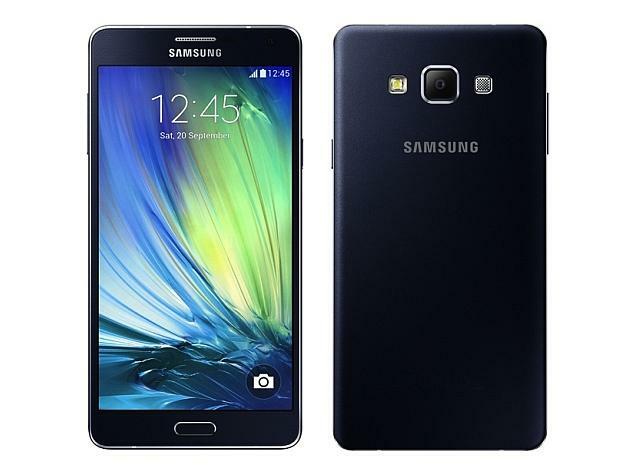 The Samsung Galaxy A7 operates on an Android v4.4.4 (KitKat) and the TouchWiz Nature UX 3.5 is installed on it. Also, the device comes with a storage memory of 16 GB which can be expanded up to 64 GB and a RAM of 2 GB is present on it. Moreover, powered by a non-removable Li-Ion 2600 mAh battery, the smartphone provides a talk time of 17 hours on 3G and music play of up to 54 hours. So what do you think about this new release by Samsung in Nepal? Do let us know in the comment section below and don't forget to check out the Samsung Galaxy A5, another high end smartphone from the Galaxy A series of Samsung.